So this is a real story. A few weeks back I had a guest in my house. I tidied up the house, okay I tidied up the parts of the house that one will encounter during a visit… JCouple of things I should clarify…my home is not designed for visitors…I don’t have extra towels, or sheets, or toothbrushes stored. I guess you can call it bachelorette living? But anyway, my lovely guest assumed that I was the average friendly human, and after the shower proceeded to go looking for extra towels in the places where extra towels would usually be kept. You know…the closet right outside the bathroom. Before I continue…let me paint a photo for you. You know how we all have that one closet that houses the things that kind of don’t have a place in the main closet? Yes I have one of those, and that is the one near my bathroom. Lets’ call that closet United Nations. Actually the UN has more order than that closet…but you get the point. To her surprise…she opened to find stashed clothes that overflowed the shelves, makeup boxes, camera equipment and let’s just say all the randomness in my life. This closet was the equivalent of using an ice cream container as Tupperware…you pray you are going to find Madagascar Vanilla Ice Cream but find spinach soup. That moment really shifted how I looked at my closets. To be honest when I am the most stressed in life, my closet is a true mirror of that. My thoughts are a full reflection of what goes in there. And I never fully realized but the existence of such disorganization weighed on me. That door was always kept shut, but at the back of my mind I knew it was a whole mess that needed my attention. Think about big problems in your life. We mentally pack them away and live our best lives, but secretly we know they are there. My friend may have found my closet, but she mostly ripped off a larger band-aid for the need for new order in my life! I made the decision that moment to work on INNER organization of my home, not just the outer ones. I have done stuff like this before but I seem to always fall back…so this time I hired the help of an amazing professional organizer, Kayla Jeter and we worked with the team at The Container Store to functionally organize my closet…and even other key parts of my home. A couple of things I learned along the way! 1. Do not organize to look pretty…organize for function. A lot of times we fall into buying cute organizing things with hopes and dreams of organizing spaces, but at my first consult with Kayla we sat down and looked at the things that were actually in the closet. We found that a lot of my workout clothes were packed into shelves there. The good news was that there was proof of previous order, but the lack of functionality showed that every time I was looking for a pair of tights, it involved me messing other things up. To help solve this, we opted for baskets as storage instead of simply folding the clothes on shelves. 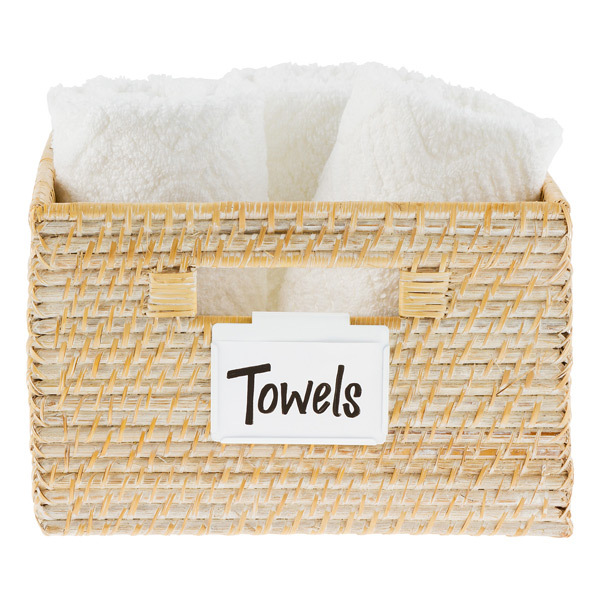 What helped was being able to purchase baskets that had a lip for a label holder. That way I could actually write down what was in each basket and not have to look around all the time. 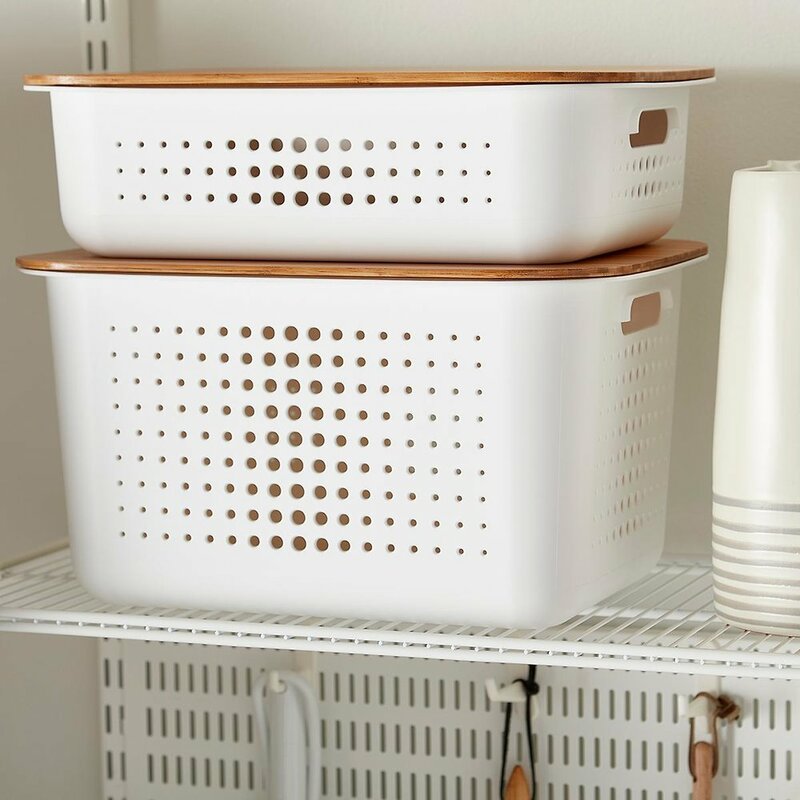 The true beauty of the baskets was that they were not only aesthetically pleasing, but if even there was a mess inside, It wouldn’t be a slippery slope for the entire closet! And you will be impressed that in the end I actually had more room in the closet than I imagined…I even added a basket where I could store extra toilet paper. We aren’t at the point of extra towels yet (baby steps), but incase a guest needs toilet paper…they know where to go! The fun part about organizing is that once you get the bug…you keep on going!!! In our conversations, we looked at other places that guests may actually frequent…and the fridge was next. Especially around holiday season, the fridge is such a crazy space. Leftovers, unfinished cans of water, juice, bottles. Some veggies that may never see the light of day, and actual chaos. When we were discussing the fridge process, I had all these ideas for things I wanted. I imagined this whole fridge that was perfectly seamless in color with all these compartments. I think I even wanted a lettuce draining thing. Then the real question came…how much lettuce do you even buy? The true answer was…none. This is definitely something to be careful of. You cannot organize for organization sake…that is how you end up with pure chaos. We looked at my current uses and to no surprise I had tons of Baby food (because who actually wants to eat veggies). I also had lots of bottles of Kombucha that kinda just sat on any shelf that had room. We opted to get fridge organizers just to keep my most frequented items in order. There is still room for lots of other things but not only is it visually appealing but also makes grocery shopping super easy. We looked into my pantry and the good news was that it wasn’t actually chaotic. Things were neatly organized in lines and brands and similar items were kept together. But as Kayla asked me to go through the motions of grabbing items, we found that I almost had to remove everything to reach something in the back. Basically to get the rice, I had to pull out all the spices, the cake mix and the tinned tomatoes. We thus opted for clear organization bins. This meant that when I needed something, I could pull out the full tray onto the counter and have an aerial view of the key item I needed and be able to grab it without displacing every single thing. I know this post was a little long, but with the hosting season fast approaching, you are probably looking at your kitchen and home like…OMG this needs help!!! As you consider the organization, I wanted to share some helpful items from the Container Store alongside some key promotions that you can take advantage of this week!!! Black Friday: Thursday, November 22nd through Sunday, November 25th, The Container Store will offer a special 25%-off single item discount to POP! Stars in-store and online. All existing and new POP! Stars will be able to take advantage of the Black Friday Offer. Cyber Week: Monday, November 26th through Friday, November 30th, POP! Stars can shop a different area of the online store on sale each day. All existing and new POP! Stars will be able to take advantage of the Cyber Week Offer. Happy shopping and feel free to send any questions or any photos of your improvements…I would love to see!! !